The Ringworld consists of a vast ring encircling the entire orbit of a star, who constructed it and why is a mystery. The cowardly but powerful Puppeteers are an alien race who are paranoid about potential threats so the Ringworld is a mystery they are determined to solve. They recruit a couple of humans and a warrior alien to accompany a Puppeteer regarded as mad by his fellows to the Ringworld but their expedition doesn’t go entirely to plan, forcing them into a fight for survival. I find that some classic Science Fiction novels have aged well and still work as good stories, even if modern readers might need to make a few allowances, but others have aged badly despite it being possible to see why they were so highly regarded at the time they were originally published. Unfortunately, I think Ringworld falls into the latter category; it may have been an award-winning hit when it was first published but if it was newly published today I don’t think it would so well received. 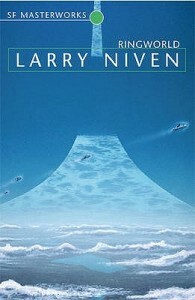 The basic premise is intriguing, but unfortunately I found the Ringworld got less interesting the more we found out about it and some parts of the exploration of the Ringworld felt disappointingly mundane, I thought Clarke’s “Rendevous With Rama” managed to do a better job of capturing the wonder of exploring a vast alien artefact (and perhaps wisely kept more mysteries unanswered). The human technology described hasn’t dated too badly but the futuristic human society described felt both bland and unconvincing. The attempts at having plausible-sounding technology felt a bit undercut by the ‘psychic luck’ plot device which felt silly and out of place in a book that spends a lot of time talking about astrophysics and orbital mechanics in an apparent attempt to appear as if it is a hard-SF book. Part of the reason the book felt a bit underwhelming isn’t really the book’s fault, the Ringworld would probably be a more interesting concept if I hadn’t encountered it similar ideas several times in later books, admittedly Ringworld deserves credit for popularising the idea but its historical significance in the genre doesn’t make it any more interesting to read. I think the characterisation was the weakest point of the book, it’s something that can be very hit-or-miss in older SF novels and I think this mostly missed. I think we’re meant to think the protagonist, Louis Wu, is a fascinating and charismatic character but no matter how many times Niven tells us how popular he is or how many friends he has or what an interesting background he has, he’s still a fairly dull and intermittently obnoxious character and although he’s meant to be 200 years old there were only occasional hints about the changes in attitude living for so long should cause. The novel’s two female characters are both treated with casual sexism and neither of them feels like a fully-developed character, Teela is particularly bland and the fact that there are plot reasons for her to be so vapid doesn’t make her any more interesting. I thought the alien characters were a bit more interesting, I thought the Kzin Speaker-To-Animals was probably the best character in the book due to his conflict between the aggressive instincts of his race and his realisation that the aggression could doom his race to extinction. It’s not a terrible book, it is a quick read with some interesting ideas, but I wouldn’t really recommend it and even if someone was interesting in exploring the history of the genre I’d say they’d be better off reading the works of some of Niven’s contemporaries such as Zelazny or Clarke.